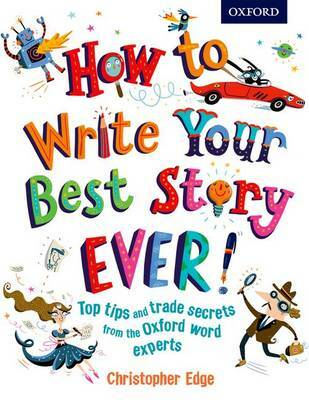 Inspired by the thousands of amazing stories sent in to the BBC Radio 2 500 Words competition, this book is a humorous and authoritative book that will awaken the author in every child, unlocking their story ideas and giving them hints and tips to create their own stories. For children aged 13 and under, this book is written in a fun, engaging, and inspirational style which will help all readers to see themselves as writers and help them to achieve their creative writing goals. It is ideal for home and schools, primary and lower secondary. The book is authoritative, linked to the curriculum requirements, but not intimidating. From how to write for your audience or for a specific purpose, how to overcome writers block, how to write in difference genres, to what words to use to best effect, this book gives children the tools they need to make writing an enjoyable experience. It is filled with tips on how to use wonderful and weird words, invent new words, and write powerful sentences using metaphors, similes, idioms. Children will soon be creating stories that will stay with the writers and readers forever. Christopher Edge is an award-winning author of children's fiction whose books include Twelve Minutes to Midnight, Shadows of the Silver Screen and The Black Crow Conspiracy (Nosy Crow), as well as non-fiction titles such How to Make Money (Scholastic) and How to be a Hero (Templar). A former English teacher, editor and publisher, Christopher now works as a freelance education and publishing consultant and has worked with clients including the Department of Education and Booktrust on projects to improve and promote reading and creative writing in schools. Visiting schools across the country, Christopher gives author talks and runs creative writing workshops for children in key stages 2 and 3 to inspire them as readers and writers. He has appeared at several literary festivals and events including the Hay Festival, Oxford Literary Festival and was a keynote speaker at the 2014 NATE (National Association for the Teaching of English) conference.